This 10.73-carat brilliant is not, by ordinary standards, exceptional. However, it was cut from the first diamond found in South Africa and therefore has historical significance. In 1866 a shepherd boy found a small, shiny stone on the south bank of the Orange River near Hopetown. The pebble was kept for a while by a 15-year-old boy named Erasmus Jacobs, who later gave it to his neighbour, farmer Schalk van Niekerk, a collector of unusual stones. Van Niekerk entrusted the pebble to John O'Reilly, a traveling peddler, who sent it, in an unsealed envelope, to Dr W.G. Atherstone of Grahamstown, one of the few people in the Cape Colony who knew anything about minerals and gems. 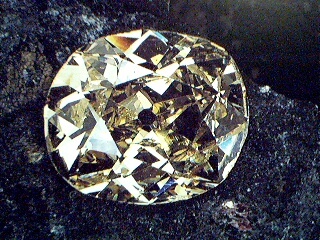 Dr Atherstone identified it as a 21.25-carat brownish yellow diamond. It was sold for £1500 to Sir Phillip Wodehouse. 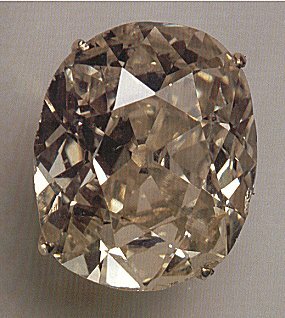 The diamond was shown at the Paris Exposition in 1867 and later cut to its present form. Although Erasmus Jacobs never found another diamond, Van Niekerk was luckier. Three years later, having learned something of precious stones, he bought what became known as the Star of South Africa.